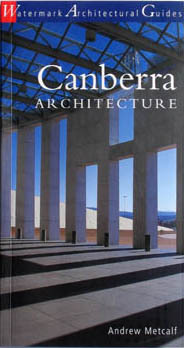 Andrew Metcalfe’s 2003 book should be on the shelf of anyone with an interest in the development of Canberra. By that I mean both its history as well as the possibilities for the future. Once you have consumed this book, you will most likely be more fired up to get out on a quiet weekend and visit some that you may have ignored or not noticed till now. This well put together book should encourage more people to appreciate good architecture in our public buildings, commercial centres as well as private residential areas. Hopefully the book will also motivate more people to care more about the lack of good design in the buildings being currently approved by the current ACT Planning Authority. This authority is now overseeing the destruction of Canberra as a place of good design and planning. Sadly it seems that current planners of this city show no motivation to encourage our governments to take a role in aesthetics, let along good design. This book is fabulous for introducing residents and visitors to the wealth of architecture scattered across the territory (up to the year 2003). It is set our logically by the main areas of Canberra with accessible text and photographs throughout. There’s a nice introduction by Roger Pegrum to the building of Canberra and the influences of both Walter Burley Griffin and Marion Mahoney. Click here for more on Andrew Metcalf (the architect – not the chief public servant). As this book is now 10 Years old, the research would benefit from being uploaded to be an online resource that could be updated from time to time. One wonders whether there is an agency out there that should be assisting with some funding to see this happen. The resource could link to other online sites, such as Canberra House, Mid-century modernist architecture – click here.